Dr Newman is Assistant Professor of Family Medicine, with a cross-appointment in the Department of Pediatrics, at Queen’s University in Kingston, Ont. Dr Davies is Professor and Chair of Maternal-Fetal Medicine at Queen’s University and Director of the Fetal Assessment Unit at Kingston General Hospital (KGH). Dr Dow is Professor of Pediatrics at Queen’s University and a neonatologist at KGH. Ms Holmes was a registered social worker in pediatrics and high-risk obstetrics at KGH. Ms Macdonald is a family and community support worker for the Thrive program at Kingston Community Health Centres. Dr McKnight is a resident in the Department of Pediatrics at Queen’s University. Ms Newton is a neonatal nurse practitioner in the neonatal intensive care unit and pediatric programs at KGH, and is an adjunct academic staff member in the School of Nursing and Department of Pediatrics at Queen’s University. Problem addressed Infants born to opioid-dependent women are admitted to intensive care units for management of neonatal abstinence syndrome (NAS), serious morbidity, and prevention of mortality; however, the disadvantages of this approach include infants experiencing more severe NAS and exhibiting a greater need for pharmacotherapy owing to the interference with mother-infant bonding. Objective of program To implement a rooming-in program to support close uninterrupted contact between opioid-dependent women and their infants in order to decrease the severity of NAS scores, lessen the need for pharmacotherapy, and shorten hospital stays. Program description Opioid-dependent pregnant women were assessed antenatally by a multidisciplinary team and provided with education and support. Psychosocial issues were addressed in collaboration with a community program developed to support addicted mothers. The mother-infant dyad was admitted postpartum to a private room and attended by nurses trained in Finnegan scoring. Infants remained with their mothers unless persistently elevated scores made transfer to neonatal intensive care units necessary for initiation of pharmacotherapy. Conclusion With the rooming-in program, the proportion of infants requiring pharmacotherapy decreased from 83.3% to 14.3% (P < .001) and the average length of stay decreased from 25 days to 8 days (P < .001). The rooming-in experience was rated favourably by participating mothers. Across Ontario there has been increasing attention in the academic press and lay media to the rising incidence of opioid dependence in the population, which has resulted in a marked increase in pregnant women presenting for prenatal care who disclose a history of opioid dependence17–20 (also Young A, written communications, 2013). Following the 2010 publication of Abrahams and colleagues’ article describing the successful use of rooming-in to manage opioid-dependent infants,14 clinicians at Kingston General Hospital (KGH) in Ontario who worked with opioid-dependent pregnant women, as well as their infants, began to discuss the possibility of introducing a similar model at our institution. Kingston General Hospital serves an average of 30 opioid-dependent pregnant women a year. In 2011, obstetric, pediatric, NICU, and family medicine staff wanted to develop a rooming-in program for eligible mothers and infants; such a program would require a unique collaboration between hospital- and community-based caregivers including physicians, nurses, social workers, and community support workers. Our goal was to implement a rooming-in program to support close uninterrupted contact between opioid-dependent women and their infants in order to improve neonatal outcomes. At KGH, all opioid-dependent pregnant women are seen at a multidisciplinary antenatal clinic. In the fall of 2011, interested clinical staff at KGH agreed to prepare eligibility criteria for opioid-dependent pregnant women who wished to receive rooming-in care. In order to reduce confounding variables, the first patient chosen to participate in the rooming-in program had no involvement with child protective services, was taking a stable dose of methadone with multiple carry doses, was not taking any other medications associated with signs of NAS, had no complicating concurrent medical conditions, and was planning to breastfeed. The patient received antenatal education about the signs of NAS (a modified Finnegan tool was used for NAS scoring) and nonpharmacologic management from a nurse practitioner (L.N. ), as well as a social worker (B.H.) who attended the multidisciplinary antenatal clinic for opioid-dependent women. The patient delivered at term. She and her infant were admitted to a semiprivate room across the hall from the NICU and were attended to by an NICU nurse. The infant was transferred to the NICU on the first evening of life owing to increasing irritability and the mother’s anxiety about her ability to console the child. Oral morphine was started at 24 hours of life and tapered over the following weeks. The total length of stay (LOS) was 23 days. This experience was reviewed during a debriefing meeting with clinical staff and nursing management. It was agreed that for the program to succeed there needed to be a period of education for postpartum nursing staff to take on the responsibility of NAS scoring. It was decided that mother-infant dyads would be provided with a private room to optimize their experience, keeping unnecessary ambient noise and light disturbance to a minimum. In October 2012, a new program initiative called Thrive was announced by the Kingston Community Health Centres and funded by the South East Local Health Integration Network in Ontario to support pregnant opioid-dependent women in the region. One author (A.N.) volunteered to sit on the community advisory group for the program; this occasioned close collaboration with the family community support workers in the program, one of whom (J.M.) joined the hospital rooming-in working group. In November 2012, the rooming-in working group recommended that the most appropriate location for postpartum care of these mother-infant dyads was in the pediatrics unit. This location provided a private room where the mother could receive usual postpartum care and, upon discharge, could stay until discharge of her infant. This recommendation was approved by the Division of Maternal-Fetal Medicine and the Division of Neonatology, as well as the hospital Obstetrics Gynecology/Pediatrics Program Council, which included physicians, nurses, midwives, nurse practitioners, residents, and a patient advocate. From December 2012 to April 2013, a series of interprofessional education sessions was undertaken, including presentations from the Division of Maternal-Fetal Medicine, the Managing Obstetrical Risk Efficiently program, and the Department of Pediatrics, as well as in-service nursing education sessions and the Department of Obstetrics and Gynecology’s annual continuing medical education event. In June 2013, an opioid-dependent mother (and also a patient of one of the authors [G.A.D.]) from the multidisciplinary antenatal clinic was prescribed oral opioids for chronic pain; she and her newborn were admitted to a private room in the pediatrics unit. They were supported by a Thrive member (J.M.) who had been involved in the woman’s care since early in her pregnancy. The attending physician for the infant was A.N., and NAS scoring was performed by the assigned nurse who had attended the in-service training sessions. The infant was discharged after 72 hours without requiring transfer to the NICU or initiation of oral morphine pharmacotherapy. In July 2013, 4 of the authors (B.H., J.M., A.N., and L.N.) began meeting weekly to review all known opioid-dependent mothers attending the multidisciplinary antenatal clinics at KGH who might be candidates for the rooming-in program. Owing to the very positive experience for most mother-infant dyads, by November 2013 it was clear that the only necessary exclusion criteria were planned apprehension by child protection services or existence of another neonatal condition that would require admission to the NICU. By September 30, 2014, 21 mother-infant dyads had been enrolled in the rooming-in program (Figure 1). Of these, only 3 infants (14.3%) required transfer to the NICU for oral morphine therapy to control withdrawal symptoms. In the 13 months preceding the implementation of the rooming-in program, 24 women taking chronic opioid therapy delivered single, full-term infants who were not apprehended by child protection services. As per usual practice, all 24 infants were admitted directly to the NICU for observation and NAS scoring within hours of birth. During the 13 months subsequent to the implementation of the rooming-in program, 21 women taking opioid therapy gave birth to full-term infants and were admitted to a private room in the pediatrics unit with their babies. Women whose infants were apprehended at birth by child protective services were excluded from the analysis, as KGH policy required that these infants be admitted to the NICU for supervision and protective custody while awaiting placement. 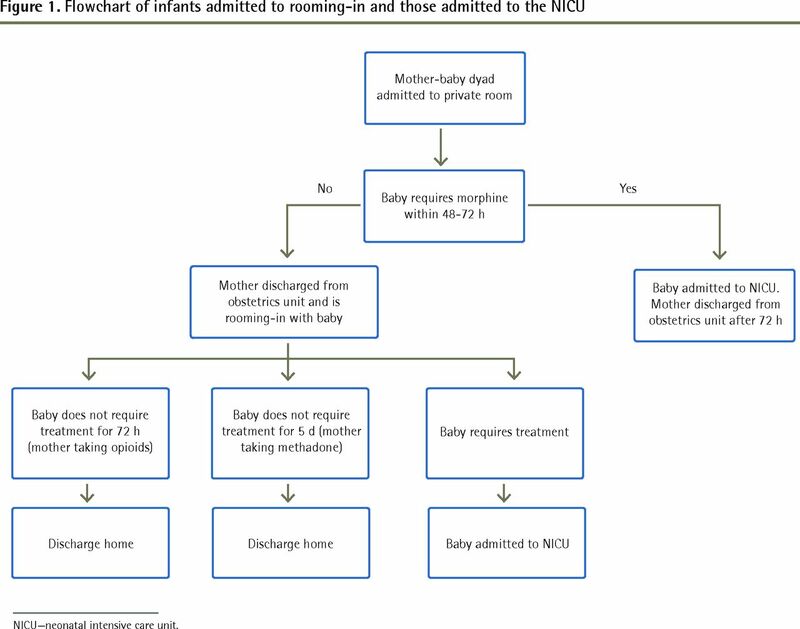 The requirement for oral morphine therapy for the neonates in the rooming-in cohort was significantly lower than those admitted directly to the NICU (3 of 21 [14.3%] vs 20 of 24 [83.3%]; P < .001). The mean (SD) LOS was also significantly shorter among the rooming-in cohort (7.9 [7.8] days vs 24.8 [15.6] days; P < .001) (Table 1). Women who participated in the rooming-in program completed a survey after discharge. Anonymous responses were obtained from 14 of the 21 participating women (Tables 2, 3, and 4). On a 5-point scale (1 = least satisfied, 5 = most satisfied), 100% of women rated their overall experience as 4 or higher and 86% reported breastfeeding their infants for an average duration of 2.5 months. This compares favourably with the general population of all women delivering at KGH, 78% of whom breastfeed for any duration. Participant ratings of the rooming-in program (on a 5-point scale from 1 = least satisfied to 5 = most satisfied): 14 of the 21 rooming-in participants completed the survey. Results of the yes-or-no answer portion of the survey: 14 of the 21 rooming-in participants completed the survey. Participant comments about the rooming-in program: 14 of the 21 rooming-in participants completed the survey. Using a community- and hospital-based multidisciplinary team, we were able to design and implement a program to support a rooming-in program for opioid-dependent women with their newborns. This cohort study demonstrates a statistically significant decreased need for pharmacotherapy and hospital LOS. As a tertiary care referral centre with a level 3 NICU, KGH has traditionally received transfers of opioid-dependent pregnant women or newborn infants from regional hospitals requiring NICU admission for pharmacotherapy of severe NAS. This approach was assumed to be the optimal way to ensure safe resolution of signs of withdrawal. We believe our rooming-in experience was successful for 2 key reasons. First, all opioid-dependent pregnant women were seen at least once in our multidisciplinary clinic where they were educated about NAS and the rooming-in goals and where staff could identify and address social risk factors before admission for labour and delivery. Second, all women had access to a community-based primary care worker who supported them at home and accompanied them to their clinic appointments and reinforced the rooming-in goals. Adoption of a more “low tech” approach has achieved better outcomes for infants, their mothers, and the hospital. The NAS scoring tool that was used to quantify withdrawal severity relies to some extent on subjective judgment and might therefore be a possible source of bias. We sought to minimize this by using the same tool in both cohorts, and maintaining the same criteria for initiating pharmacotherapy before and after implementation of rooming-in. Using a multidisciplinary team model that involved various professionals from the hospital, the university, and the community, KGH was able to make a smooth transition from a practice of admitting all infants born to opioid-dependent women directly to the NICU to one that permitted rooming-in and only resorted to NICU admission if pharmacotherapy was required. Length of stay and the need for pharmacotherapy were dramatically reduced within the first year of implementation, and mothers rated their experience with the program favourably. Future research might focus on medium- and long-term neonatal and childhood outcomes, including rates and duration of breastfeeding; quality of mother-infant bonding and involvement of child protective services; and growth, development, and behavioural effects on children exposed to the rooming-in model of care as infants. We hope that our experience will encourage all hospitals in Canada providing newborn care to opioid-dependent women and infants to consider the rooming-in model of care. With funding from a College of Family Physicians of Canada Janus grant, Dr Newman spent 3 weeks in September 2013 observing the practice in the Fir Square Combined Unit at the Children’s and Women’s Hospital Health Centre of British Columbia in Vancouver. Dr Dow was Co-Chair of the Provincial Council for Maternal and Child Health’s Working Group on Neonatal Abstinence Syndrome, which developed guidelines for its management. Infants born to opioid-dependent women are often admitted to intensive care units for neonatal abstinence syndrome monitoring. Most infants will require pharmacotherapy and a prolonged hospital stay. Kingston General Hospital in Ontario implemented a rooming-in program for these mother-infant dyads to improve neonatal outcomes. The rooming-in program at the hospital resulted in less use of hospital resources while improving the experiences of opioid-dependent women and the short-term health outcomes for their infants. This hospital’s rooming-in program was successful because the opioid-dependent women were seen at least once in the multidisciplinary clinic, they were educated about neonatal abstinence syndrome and rooming-in goals, their social risk factors were identified, and they were given access to a community-based primary care worker who could support them at home and at their clinic appointments. Les nouveau-nés de mères ayant une dépendance aux opiacés sont souvent hospitalisés dans des unités de soins intensifs pour la surveillance du syndrome de sevrage néonatal. La plupart de ces enfants ont besoin de médicaments et d’une hospitalisation prolongée. Au Kingston General Hospital en Ontario, on a fait l’essai d’un programme de cohabitation mère-enfant afin d’améliorer l’état de santé néonatal. Le programme de cohabitation hospitalière mère-enfant a eu comme effet de réduire le recours aux ressources hospitalières tout en améliorant les connaissances des mères toxicomanes ainsi que l’état de santé à court terme de leurs enfants. Le succès de ce programme de cohabitation à l’hôpital repose sur le fait que les femmes ayant une dépendance aux opiacés ont été vues au moins une fois à la clinique multidisciplinaire, qu’on les a renseignées sur le syndrome de sevrage néonatal et sur les buts de la cohabitation à l’hôpital, qu’on a identifié leurs facteurs de risque d’ordre social et parce qu’on les a mis en contact avec un intervenant de première ligne de leur communauté capable de leur fournir un soutien à domicile ou lors de leur rendez-vous à la clinique. All authors contributed to the concept and design of the program; data gathering, analysis, and interpretation; and preparing the manuscript for submission. Society of Obstetricians and Gynaecologists of Canada. SOGC clinical practice guidelines: substance use in pregnancy: no. 256, April 2011. Int J Gynaecol Obstet 2011; 114 (2) :190–202.
. Neonatal drug withdrawal. Pediatrics 2012; 129(2):e540–60. Erratum in: Pediatrics 2014;133 (5) :937.
. Neonatal abstinence syndrome: assessment and management. Addict Dis 1975; 2(1–2):141–58.
. A proposed narcotic withdrawal score for use with newborn infants. A pragmatic evaluation of its efficacy. Clin Pediatr (Phila) 1975; 14(6):592–4.
. Management of chemical dependence in pregnancy. Clin Obstet Gynecol 2008; 51(2):445–55.
. Clinical care for opioid-using pregnant and postpartum women: the role of obstetrics providers. Am J Obstet Gynecol 2014; 210(4):302–10. Epub 2013 Oct 10.
. Safety of the newer class of opioid agonists in pregnancy. Can Fam Physician 2014; 60:631–2 (Eng), e348–9 (Fr). Ontario hospitals maternal-child benchmarking report 2013. Toronto, ON: Provincial Council for Maternal and Child Health; 2013. Available from: www.pcmch.on.ca/wp-content/uploads/2015/07/PCMCH-2013-MCBR.pdf. Accessed 2015 Nov 6.
. Increase in prescription opioid use during pregnancy among Medicaid-enrolled women. Obstet Gynecol 2014; 123(5):997–1002.
. Review of the assessment and management of neonatal abstinence syndrome. Addict Sci Clin Pract 2014; 9 (1) :19.
. A survey of the management of neonatal opiate withdrawal in England and Wales. Eur J Pediatr 1996; 155 (4) :323–6.
. Rooming-in compared with standard care for newborns of mothers using methadone or heroin. Can Fam Physician 2007; 53 :1722–30.
. Neonatal abstinence syndrome— postnatal ward versus neonatal unit management. Eur J Pediatr 2010; 169 (1):95–8. Epub 2009 May 14.
. An evaluation of rooming-in among substance-exposed newborns in British Columbia. J Obstet Gynaecol Can 2010; 32 (9) :866–71.
. Neonatal opiate withdrawal and rooming-in: a retrospective analysis of a single center experience. Klin Padiatr 2013; 225(5) :247–51. Epub 2013 Aug 21.
. A rooming-in program to mitigate the need to treat for opiate withdrawal in the newborn. J Obstet Gynaecol Can 2012; 34 (5) :475–81.
. Nonmedical use of opioid analgesics among Ontario students. Can Fam Physician 2010; 56 :256–62.
. Prescription painkiller abuse exploding in Hamilton. CBC News 2013 Nov 12. Available from: www.cbc.ca/news/canada/hamilton/news/prescription-painkiller-abuse-exploding-in-hamilton-1.2419875. Accessed 2015 Nov 9.
. OxyContin and other opioids tied to 1 in 8 deaths in young adults, Ontario study shows. CBC News 2014 Jul 7. Available from: www.cbc.ca/news/health/oxycontin-and-other-opioids-tied-to-1-in-8-deaths-in-young-adults-ontario-study-shows-1.2696995. Accessed 2015 Nov 9. Doctors’ groups agree painkillers are overprescribed. The Globe and Mail 2014 Oct 6. Neonatal abstinence syndrome clinical practice guidelines for Ontario. J Popul Ther Clin Pharmacol 2012; 19(3):e488–506. Epub 2012 Nov 23. Are family medicine residents adequately trained to deliver palliative care?